Acne is most commonly caused by the attempted secretion of sebum by the sebaceous gland through a blocked pore. Sebum itself is believed to be a natural moisturiser for the skin. The problem comes in with that sebum mixes with dead skin cells, dirt and bacteria and thus blocks the pore opening, causing a pimple to appear in the affected area. 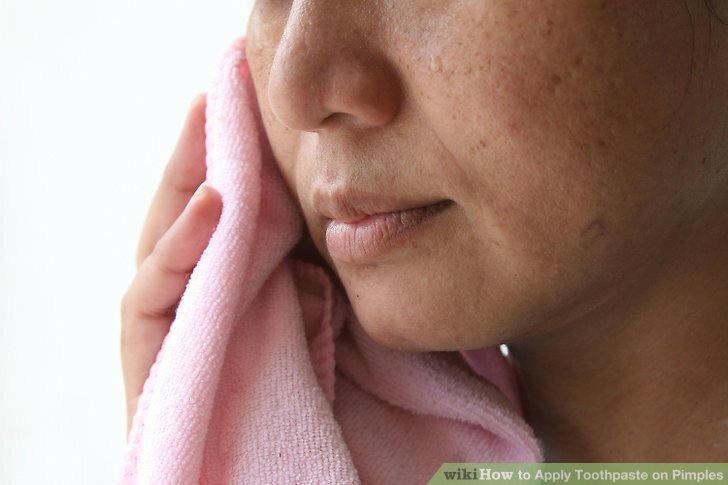 It is a common claim that dabbing ordinary toothpaste on pimples can cause the excess sebum to dissolve, thus abating, or eliminating totally, facial acne. But is this true, or is it another of the many myths that have grown up around acne? Toothpaste is marketed as a means of preventing tooth decay. There are as many as 500 different bacteria known to cause tooth decay, but one of the most active is Streptococcus mutans. This bacteria converts carbohydrates into something called lactic acid. What this lactic acid does is decrease the pH value on the tooth surface, thus degrading the calcium phosphate which is present in tooth enamel and starting the formation of dental cavities. The major active ingredient of toothpaste is fluoride. Fluoride protects the tooth enamel from being eaten away by the lactic acid. This fluoride can be present in several different chemical forms, depending on the manufacturer. The most common forms are sodium fluoride and sodium monofluorophosphate. Both of these can cause irritation to the skin, even causing blistering. Other components of toothpaste include menthol for the freshening of breath, alcohols and biocides designed to kill the bacteria which causes dental plaque and gingivitis, food extracts as flavourants and also small beads, known as microbeads which assist in the scrubbing action and plaque removal. So let us take a closer look at what all these ingredients could do if applied to the skin. Remember, we are starting with a pore that is full of sebum and ready to burst. We now add toothpaste, which may cause the skin to dry out. The fluoride contained in the toothpaste may cause itching, scaling, reddening of the skin as well as blistering that may result in being more unsightly than the acne was to start with. The biocides in toothpaste are chosen specifically for the combating of bacteria in the mouth, and so may have no effect on the bacteria on present in your skin. The other ingredients also acts as irritants, having the same effect as the fluoride as well as being a potential source of infection. Finally, the microbeads contained in some toothpastes could potentially enter the pore, reclogging it, or opening the infection route again. So what does all of this mean? In the best case scenario, yes, the alcohols in toothpaste can, and probably will dissolve the sebum that causes acne, with the only side effect being dry skin. However, the chances are higher that using toothpaste to treat your acne will result in bigger problems, such as blisters. Should these blisters burst, you will then have a larger open pathway for infection to occur. The companies that produces toothpaste formulate their products to strengthen the teeth, reduce the buildup of dental plaque, clean the teeth and eliminate bad breath. Although toothpaste could potentially be used to treat acne, it was not designed for this purpose and may cause more damage than it cures.